The most common and widely used corrosion resistant roller chain in the world is a stainless steel roller chain. 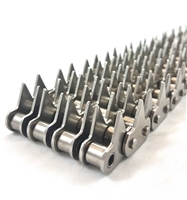 This is due to the highly anti-corrosive properties of stainless steel, as well as the extremely broad range of temperatures and applications that stainless steel chains can operate in. USA Roller Chain and Sprockets as the largest selection of stainless steel roller chain in the world. Ranging from ANSI B29.1 to ISO and DIN specification standard sizes we have the chain you need. We also offer specialty stainless steel roller chains such as MEGA stainless steel chain, 316-stainless steel roller chains, and custom manufactured stainless steel roller chain. When it comes down to the basics, our stainless steel roller chains have heat-treated surfaces for an extended wear life as well as better long-term performance and strength. The pin link is the outer link of a stainless steel chain and consists of two pins and two outside side-plates. The "quick detachable" version of this link is called a stainless steel connecting link (as shown in the photo above with a spring clip). 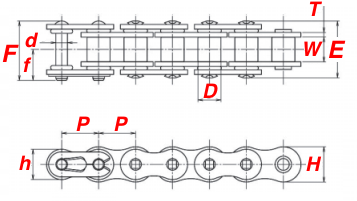 The 2nd component to a stainless steel roller chain is the "roller link" or the inside link. This consists of two bushings, two rollers, and two inside side-plates that are precision-pressed on to hold everything internally together. We offer an in-stock solid bushing/ solid roller stainless steel roller chain that out-performs and holds up better than some of the most expensive name brands on the market (ask your sales rep for details). Please note: We also supply individual stainless steel components. 50SS 0.625" 0.375" 0.400" 0.794" 0.594" 0.079"
Note: C2042SS, C2052SS, C2062HSS, and C2082HSS have oversized rollers. Note: C2042SSHP, C2052SSHP, C2062SSHP, and C2082SSHP chains have oversized rollers. When making a comparison with other roller chains versus going full stainless steel a few things need to come into consideration. The environment, strength requirements, and application type. One of the main questions we at USA Roller Chain get asked is what is the most anti-corrosive chain out of the corrosion resistant roller chain options. Below we are going to line each option up starting from least-corrosive to most corrosive. Zinc Plated - Zinc plated chains offer the least protection against corrosion. These chains are used in applications that require a chain that can handle a broader scope of temperatures than a plain carbon chain. Nickel Plated - Nickel plated roller chains are good for mild corrosive applications like gate operators, light salt-spray applications, and semi-damp or humid applications. However, over time the nickel plating will chip and crack, then flake. This is why nickel plated roller chains are not recommended in food applications. Coated Series - Coated series roller chains offer the best anti-corrosive properties for a non-stainless chain. The only exception to this is that some chemicals such as highly concentrated chlorine, acid, and other chemical types will eat through the coating. In applications where those chemicals are present please speak to your USA Roller Chain representative to find the best match for your needs. 304-Grade Stainless Steel - This is the most common grade of stainless steel used because it has good chemical resistance and is extremely resistant to corrosion. 316-Grade Stainless Steel - This grade of stainless steel offers slightly better properties when it comes to chemical attack resistance and welding. Something important to note about our stainless steel roller chains is that they are primarily austenitic, meaning they are non-magnetic. 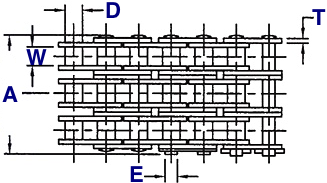 As you can see from the above demonstrations 316-grade stainless steel roller chain has the least magnetism out of all three grades, it is a common misconception that 304-grade stainless steel roller chains are non-magnetic. Stainless steel roller chains are usually recommended in environments where a coated or nickel plated roller chain won't hold up as long. These environments include; chlorine applications, chemical wash down applications that are un-compatible with other anti-corrosive chains, or applications requiring a stainless steel chain (food processing, medical, etc..). One common misconception today is that a stainless steel roller chain is actually higher strength than a carbon steel chain. Because both 304 and 316 grade stainless is a softer material than carbon steel a standard stainless steel chain can be as much as half the strength of the equivalent chain size in carbon steel material. However, we stock a "mega" stainless steel chain that offers carbon steel equivalent strength ratings due to its extremely complex design and manufacturing process. Coated and plated roller chains are good for applications that require a high-strength anti-corrosive chain or budget applications. 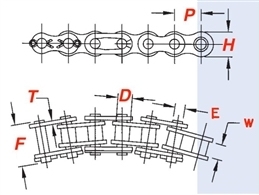 However, most coated and plated chains are not recommended for food production due to cracking and flaking over time of the anti-corrosive layer. Stainless steel roller chains are not recommended in applications that require a high strength chain unless you are using a mega-series stainless steel chain. 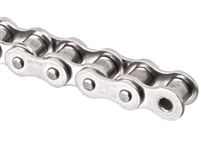 Something else important to note is that when using a stainless steel chain you are not required to use a roller chain lubricant. Economy Plus stainless steel roller chains are made to ANSI B29.1 standards and are recommended for light to general duty industrial applications. They feature a solid roller design for an extended working life and better performance. We supply economy plus stainless steel roller chain in 10' boxes, 50' reels, and 100' reels. General Duty Plus stainless steel roller chains are the best value and have a solid roller and solid bushing design for ANSI sizes #40 - #80. This poses a better long-term performance in most applications due to a decrease in internal friction. General Duty Plus roller chains also have higher strengths than the Economy Plus and use components that are more polished for better aesthetics. We typically stock these chains in 10' boxes, 50' reels and 100' reels, but cut-to-length options are available for General Duty Plus stainless steel roller chains. Premier Series stainless steel roller chains are the top tier when it comes to a stainless steel roller chain. They use the highest quality stainless steel and have an extremely solid construction to eliminate side flexing. Premier Series stainless steel roller chains have the highest tensile strengths of any ANSI or ISO standard stainless steel roller chain and have published working loads. They also have high-polished side plates for improved aesthetics. We typically stock these chains in 10' boxes, 50' reels and 100' reels, but cut to length options are available for Premier Series stainless steel roller chains. 304-Grade Stainless Steel is the most common grade used with our roller chains. It is a non-magnetic material that is highly resistant to corrosion and can operate in temperatures ranging from -200° to +700° Fahrenheit. 316-Grade Stainless Steel is the second most common grade used. 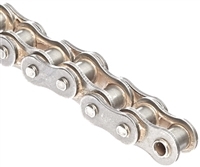 We typically stock 316-grade stainless steel roller chain in ANSI sizes #25 - #80, but we can supply other sizes and even specialty MTO chains in 316-grade as well. Some of the benefits of using a 316-grade stainless steel over 304-grade stainless steel are superior resistance to corrosion, greater resistance to chemical attack, more durable, easier to clean, easier to weld, and in most applications, it will last longer. 403-Grade stainless steel is primarily used for wastewater application chains but we can manufacture standard and non-standard roller chains out of 403-grade stainless steel upon request. This grade of stainless steel has good impact strength, corrosion, and scaling resistance, and is magnetic. We also stock some non-standard and specialty stainless steel roller chains that other companies typically don't have. If you do not see the stainless steel roller chain needed below, we can have anything manufactured! 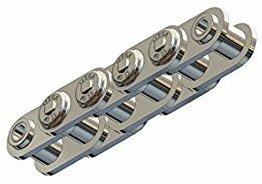 Stainless Steel hollow pin roller chains are typically found in conveying and elevating applications that require a highly corrosion resistant roller chain. We typically stock these chains in ANSI sizes 40HP - 80HP, double pitch sizes C2040HP - C2082HP, and ISO Metric sizes 08BHP - 12BHP in 304-grade stainless steel; 316-grade stainless steel is available upon request. Stainless Steel O-Ring roller chain is designed for extremely harsh applications. The O-Ring design prevents debris from getting into the internal components of the chain thus preventing premature wear. 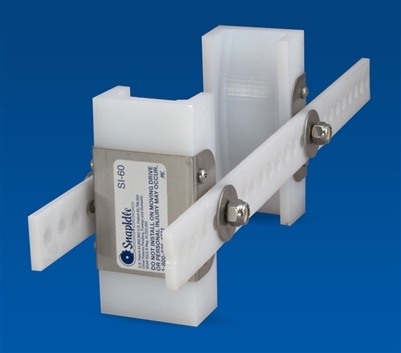 This is extremely beneficial in many processing applications where it is imperative that little to no contents get stuck within the roller chain where it is extremely difficult to wash out. We typically keep ANSI sizes 40OR - 80OR in stock in 316-grade stainless steel but other sizes and materials are available upon request. Stainless Steel sticker chains are typically used in meat processing applications, as well as applications that require a corrosion resistant sticker style chain. We typically keep 304-grade singe-strand and quad-strand stainless steel sticker chain in stock but other strands, materials, and sticker configurations are available upon request. 316-Grade stainless steel roller chain has the benefits of superior corrosion resistance, chemical attack resistance, and durability when compared to standard 304-grade stainless steel roller chains. We typically have ANSI sizes #25 - #80 in stock as 316-grade stainless steel but other sizes are available upon request. Stainless steel side flexing roller chains, also known as side bow chain, are used in a broad range of applications that require an anti-corrosive chain that can flex around a guide track or turn in a conveyor. We typically stock ANSI Sizes #40SB - #80SB and base chain sizes 43SS - 63SS in 304-grade stainless steel, but other sizes and material grades are available upon request. 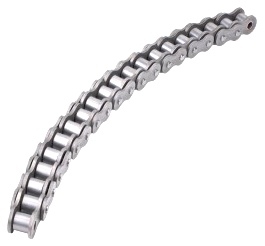 Mega Series stainless steel roller chain is the longest lasting and highest strength stainless steel roller chain in the world that operates on standard stainless steel sprockets. This chain is in stock in ANSI Sizes #40 - #80 in a 304-grade stainless steel, but other chain sizes and grades are available upon request. 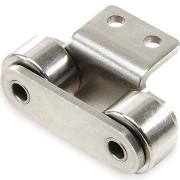 Stainless steel roller chain attachments or stainless steel attachment chains are an "off the shelf" standard item at USA Roller Chain and Sprockets. 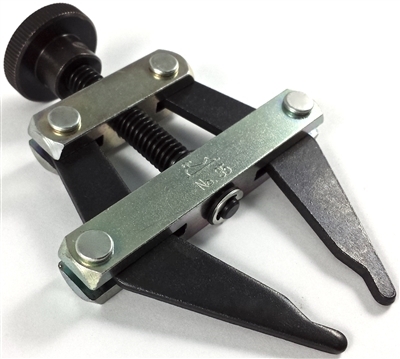 We stock the widest range of standard and specialty attachments in the industry, including ISO Metric stainless steel attachments. Tensioning a stainless steel roller chain is just as important as it is to other a standard carbon steel chain. 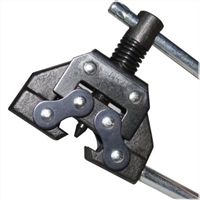 We stock a lineup of non-metallic and stainless steel roller chain tensioners for any application. Besides stainless steel roller chains, we also stock a full line of high-quality accessories. 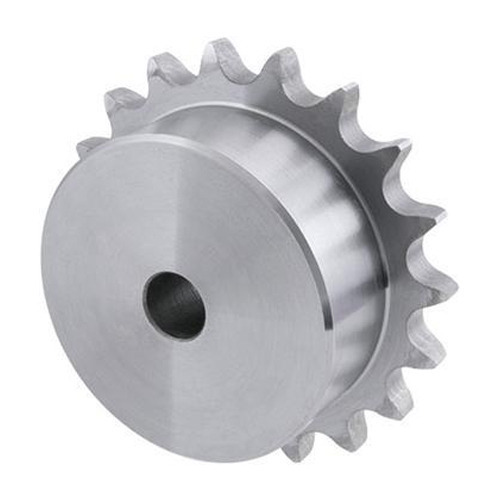 We have stainless steel sprockets, chain breakers, chain pullers, chain guides, and chain tensioners. For more information or to get a quote please contact us, and we will be happy to assist you!